There are many types of roller coasters for thillseekers to experience. Some of the most thrilling designs are inverted roller coasters, which position riders on the outside of the coaster track in ski lift style seats while racing through loops, twists, and dives. Dual inversion elements that turn riders upside down twice in just a few seconds add extra thrills and screams. 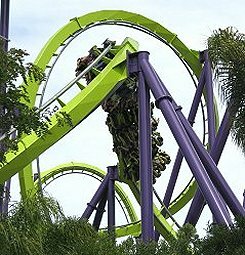 While the Hulk roller coaster at Islands of Adventure uses a cobra roll element, other variations include batwings or consecutive loops. Mine train style roller coasters simulate the out of control feel of a runaway mine car. Steep banks, sudden drops, and sharp curves are characteristic of these designs, as are the faux train ties between the tracks that add to the mine theme. Wild mouse roller coasters have sharp hairpin curves and quick dips throughout their small, compact tracks to keep riders guessing every foot of the way. Some of the world's tallest and fastest roller coasters, such as Kingda Ka, use hydraulic launch propulsion systems to reach incredible speeds. Other launched coasters use, magnets air pressure or accelerating tire systems to reach their top speeds. While the smooth, gradual curves of a flying roller coaster design may not seem intimidating, the fact that riders are lying on their stomachs and facing the ground makes these coasters innovative and unique while they offer a special type of thrill to riders. Coasters that drop straight down are the ultimate thrill for many riders. Dive machines such as SheiKra at Busch Gardens Tampa also offer an exciting holding brake at the top of the drop so riders get an intimate view of the thrills to come. Kraken at Sea World Orlando is a floorless roller coaster, a unique design that combines loops and dives with the adrenaline rush of an open air feeling. These thrill rides have a floor in the loading station so riders can board the train, but as the ride begins that floor drops away and the excitement rises. Classic wooden coasters show a distinctive profile of undulating hills that give riders a fun feeling of airtime as they speed over each bump. Other elements include banked turns and weaving through the heavy wooden beams that make up the ride's structure. Many classic wooden coasters were designed as twins, with two trains running nearly identical tracks in a race that added a competitive thrill to the ride. Today, these coasters are scarce, though a more unique design - dueling coasters - uses a similar layout while the coasters fly past one another in thrilling near misses. A shuttle design has a track that one train will complete traveling in both directions. The most thrilling of these designs may include holding brakes at the top of the tower to keep riders suspended at the maximum height for a few seconds. The boomerang shuttle design is one of the most popular in the world. These compact coasters travel through a loop and have boomerang elements both forwards and backwards, giving riders a total of six inversions in just a few seconds. Smaller roller coasters, like those at carnivals and small amusement parks, are quick, fun rides that often rely on sudden drops and sharp turns for fast paced thrills. They typically use small cars that seat fewer passengers at once for a more intimate ride. Indoor roller coaster designs, such as Space Mountain at Disneyland, are often heavily themed to create a surreal experience for riders. Space themes, haunted houses, and completely dark rides are all popular choices. For more information about roller coaster designs, see How Do Roller Coasters Work, Physics of Roller Coasters, and Roller Coaster Safety Tips.